Note: this summary in English is published here for the convenience of our non-Spanish-speaking professors and students. Nevertheless, always refer to the terms and conditions (términos de referencia) of this call in the Spanish language. Professors at Universidad Nacional de Colombia developing research and creation activities, as established by Acuerdo 123 de 2013, Superior University Council. Ph. D. or Master's students, of any area, and students of health specialties (especialidades) at Universidad Nacional de Colombia. 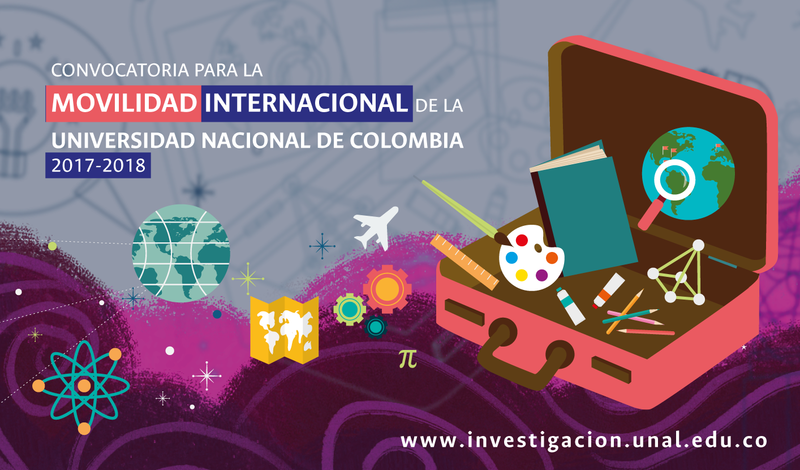 Type 1: co-funding for researchers and artists living permanently abroad to visit Universidad Nacional de Colombia. Type 2: cofinanciación de researcher- or creator-professors at Universidad Nacional de Colombia to present research results or artistic representations at international events, or to support research stays or artist-in-residence programmes abroad. Type 3: co-funding for postgraduate students in any area or students of health specialties (especialidades) at Universidad Nacional de Colombia, to present research results at international events. Type 4: co-funding for Master's or Ph. D. students in any area, or students of health specialties (especialidades) at Universidad Nacional de Colombia, to support research internships (pasantías) or artist-in-residence programmes abroad. The Research System of Universidad Nacional de Colombia has allocated up to COP 5,235,000,000, from research funds belonging to the national, campus and faculty levels, in equal shares, according to their investment projects for the 2016-2018 period and in accordance to their availability of financial resources. This disposition does not prevent any of the three levels from providing additional resources. For the border campuses (Amazon, Caribbean, Orinoquia and Tumaco-Pacific) and the inter-faculty institutes, the national level and the respective campus will provide the funds in equal shares. The Universidad Nacional de Colombia's International Mobility Call 2017-2018 (Convocatoria para la Movilidad Internacional de la Universidad Nacional de Colombia 2017-2018) opens from 29 March 2017 permanently until the allocated funds are exhausted. In any case, it will close no later than 30 October 2018. The timeline for this call may be modified according to institutional needs and budget availability. For inquiries about the application form at Hermes Information System, please send a message to hermes@unal.edu.co or call (+571)3165000 extension 11111.